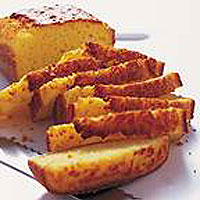 This bread is made using ground maize, also known as polenta. Grease a 900g loaf tin and line the base with greaseproof paper, which should also be greased. Make a well in the centre of the flour mixture then pour in the beaten eggs, milk and melted butter. Stir with a wooden spoon until smooth. Pour the mixture into the loaf tin and bake in a preheated oven 200°C, gas mark 6, for 40-45 minutes until risen and golden brown. The loaf should be firm to the touch. Leave to cool in the tin for 10 minutes before turning out onto a cooling rack. Serve warm or cold, cut into slices.